Crosby (January 29, 2019) – Early Tuesday morning, a rollover crash happened in front of Crosby Middle School. The car accident happened around 6:50 a.m. on FM 2100. A black sedan collided with a black minivan. The sedan flipped upside down along the side of the road. Life Flight took at least one person to the hospital, but the details of the injuries are not yet known. A spokesman for the school district says there’s no word as to whether or not the wreck involved any students or staff. The cause of the crash is unknown. Crash investigators will review all factors that may have led up to the accident. 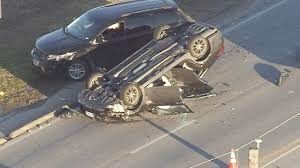 If you or a loved one were involved in a car accident, it is important to contact a car accident legal expert to help you evaluate your options. Call (713) 987-7111 or send us an email to discuss your car accident injury case.